Dizziness, unsteadiness, and imbalance can cause a very unpleasant, frustrating experience of daily life. These symptoms also put you at risk for falls. There are many different causes of dizziness including conditions of the inner ear, medication side effects, changes in blood pressure, or prolonged bed rest. You may also feel dizzy or imbalanced after sustaining a concussion. Did you know that physical therapy can help? Balance problems and vestibular disorders are multi-factorial in nature and require a thorough exam to identify contributing factors allowing for development of a comprehensive treatment plan. Musculoskeletal Evaluation: Your evaluation will include an assessment of your posture, muscle flexibility, muscle strength and gait analysis. Dizziness/Balance Evaluation: Your evaluation will also include balance testing, as well as positional testing designed to establish the source(s) of dizziness. Sometimes, we may do simple tests to check your eye movements as they related to your symptoms. Education: We spend time discussing your diagnosis and encourage self-management strategies as part of our comprehensive treatment approach. Treatment: Our aim is to get you feeling better from the first visit. Depending on the cause of your dizziness, you may need a simple positioning maneuver to help minimize symptoms. Other diagnoses may respond well to manual therapy, or hands-on techniques designed to improve the symmetry and tone in the muscles of the head and neck. For balance disorders, we focus on a combination of core strengthening and balance challenges to prepare your body systems for the unexpected. 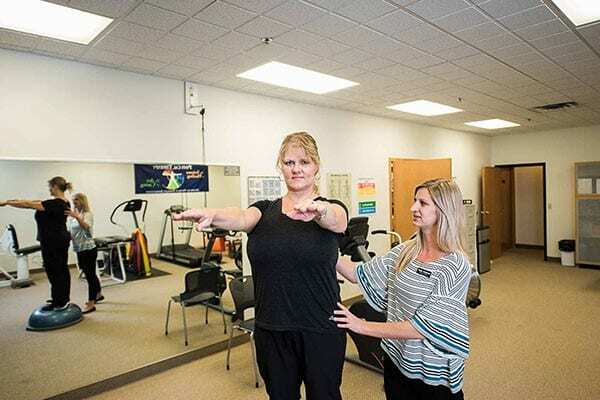 Vestibular Rehabilitation Therapy: Saunders therapists also offer VRT, or specific exercises to decrease your dizziness and improve your balance following injury to the vestibular apparatus. VRT protocols are designed to restore your ability to focus the eyes while moving the head, develop improved postural strategies and increase levels of daily function.